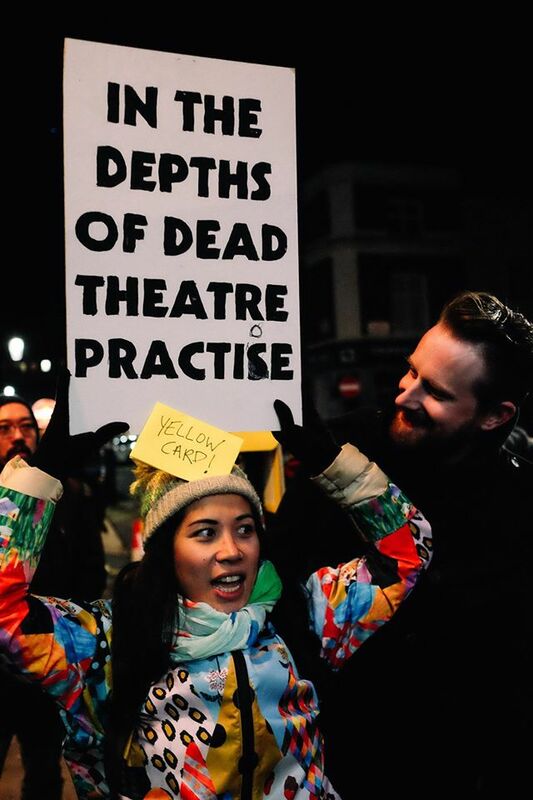 Why did East Asians, theatre practitioners, academics and friends protest against Yellowface casting in Howard Barker’s play, In the Depths of Dead Love, at the Print Room, 19th January 2017? Thursday 19th January saw a peaceful protest of Chinese, East Asians, theatre practitioners, academics and friends at the Print Room in London where Howard Barker’s play, In the Depths of Dead Love, was performed by white actors in yellowface casting. 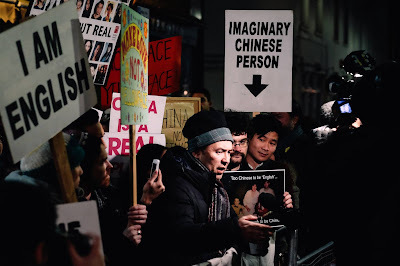 Despite being set in “ancient China”, all the Chinese-named characters are played by white actors, rendering us invisible, dehumanised and vulnerable at a time when anti-Chinese feeling is being whipped up by forces who want war with China. In a world rapidly lurching to the right. Barker does the work of the state in denying us our value as human beings. The Print Room, a hedge-fund-financed theatre in Notting Hill (Iraq War co-ordinating bank J P Morgan’s Bill Winters is the artistic director’s husband who helped fund the theatre), denied that the play was about China, spouting pseudo-intellectual drivel about it only being a metaphor, and that it’s actually an English play about English people; the not-so-sub-text being that no-one who looks like me can possibly be English even if born and raised here, absorbing the culture from birth and participating from first word, first picture, first dance, first song. So now I am a mere metaphor: an unreal person from an unreal place. Window dressing for an unutterably dull and pompous exercise in bourgeois angst. His characters lead such drab and tedious lives that perhaps the only way they have to render themselves interesting to themselves, each other and the audience is to get togged up in chinoiserie drag. This would be the only acceptable explanation but somehow we doubt it. Instead, the paucity of Barker’s imagination has him reaching into strangers’ lives and ripping the guts out of us. 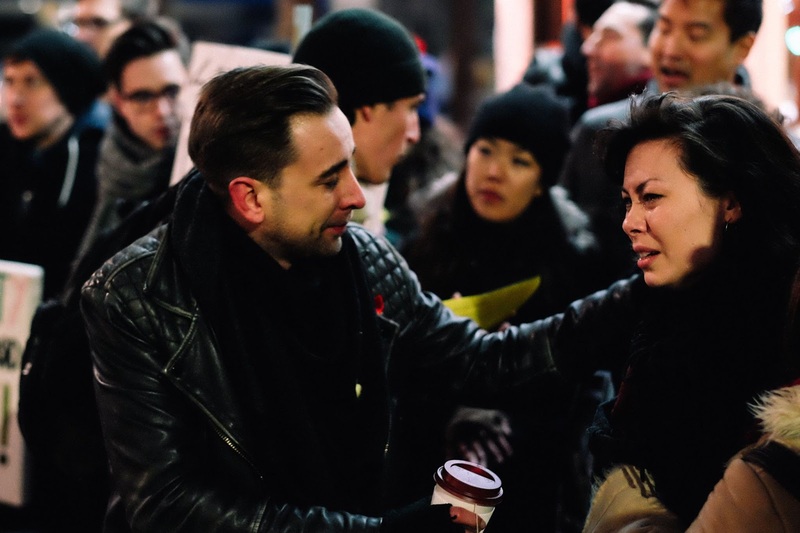 Howard Barker, our ‘greatest living playwright’ (according to some), made his reputation as a leftist, so his capitulation to reactionary racist practice is even more shocking. He professes contempt for “messages in plays” in a supine press when his message is very clear: black is white; to be English is to be white. Greater self-love hath no man than this: that he throws what are commonly perceived as the weakest minorities under a bus for his career. If he has any character left I hope that in the wee small hours when there’s only him and his conscience, he will think hard and deep about perpetuating yellowface practice and let us know what he’s come up with. It is not only intellectual sleight of hand concerning race and purported artistic freedom that we need to check. There is a bigger argument to be had regarding the role of art and politics. The revelation that the Print Room is founded in part on JP Morgan’s Iraq War money raises more questions about who art serves — and be sure about this: it always serves someone. This author would not cross the threshold of an establishment with such a strong whiff of sulphur and hopes that others feel as strongly. For me, Anda and Bill Winters might as well have built the Print Room on an ancient native American burial ground. 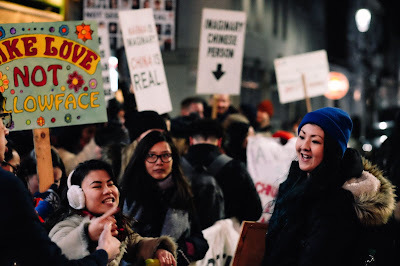 There has been a flurry of activity and writing from people who care about our culture and our world, who see the arts as more than privileged rich whites raiding the ethnic dressing-up box for a bit of entertainment. From Facebook and Twitter to blogs and academics and the press, it’s not only East Asians who are horrified by this backwards step. Here follows a chronology of the battle which some are calling The Orphan of Zhao II: This Time It’s Personal. … It is no more acceptable today asking a Caucasian actor to play an East Asian role than asking another actor to play Othello by handing him a tin of boot polish. Simply put, it’s morally reprehensible. 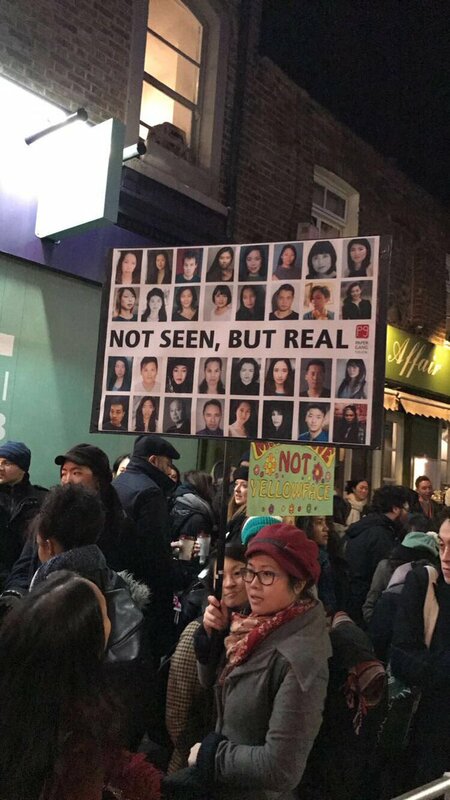 I ask you as Artistic Director to consider meeting with the creative team of In The Depths Of Dead Love immediately and ask them to reconsider this disgusting and bigoted casting or that you pull the production from your programme until they are able to satisfy its casting requirements without detriment to East Asian actors in London. … With the release of a statement on Monday attempting to explain their process, the leadership of the Print Room hasn’t defended themselves by protesting that they had indeed attempted to cast the role with Asian actors. Rather, they denied that race and ethnicity mattered at all in casting. 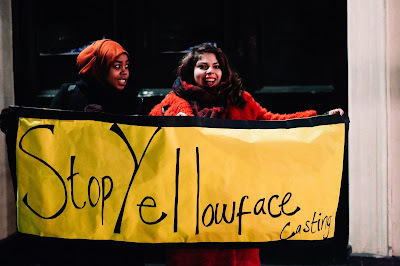 In doing so, the theatre showed that it does not comprehend what yellowface and racial erasure mean, and have made no effort to show any empathy to the community they have affronted. 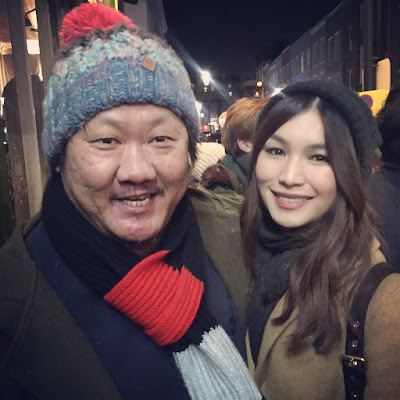 … In the Depths of Dead Love is by a British playwright born in 1946 and writing in the 21st century, not the creator of stories written centuries ago at a time when knowledge of Asian culture was steeped in ignorance and caricature. Barker cannot claim to be WS Gilbert writing about England in The Mikado, despite its faux Japanese setting. Indeed, he is a historically and socially aware playwright. Saying the work is a fable is not a license to be culturally clueless. 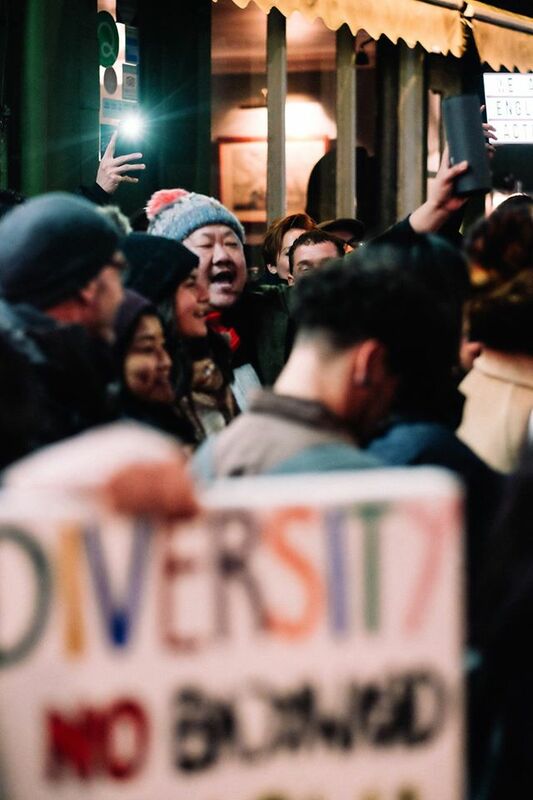 … The Print Room would do well to consult with Asian artists and indeed many BAME artists if they wish to remedy this situation, rather than forging forward with abstract, disingenuous excuses that fool no one who actually understands what diversity and inclusion genuinely mean. The Stage 13.01.17: Print Room “artistic” director describes our protestations as a “social media attack” proving Mrs Hedge Fund couldn’t give a flying one. … This is a difficult issue for us and we will take any responsibility for mistakes we make – we always have more to learn. But I’m basically saying, we didn’t make any, so ha. Wealth brings power, the power to open a theatre in London’s Notting Hill, the power to define human beings as worthy or not of inclusion, of defining whether or not we are English. Rich white women in need of a hobby get to do that to us because they are married to bankers, specifically, senior bankers in JP Morgan during the Iraq War era of wealth extraction and paying Tony Blair £2-3 million pa.
… Remember this is meant to be an apology. 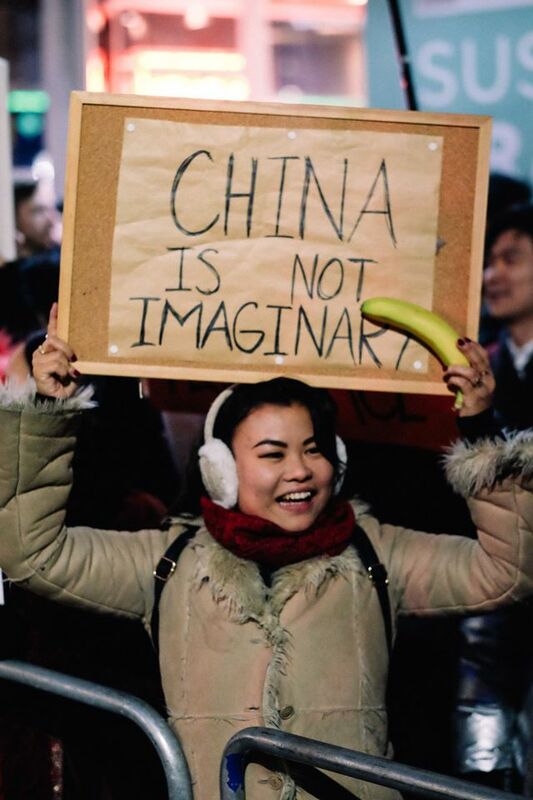 Instead, you seem to be suggesting that it is OK because the ‘Chinese’-ness is not real. 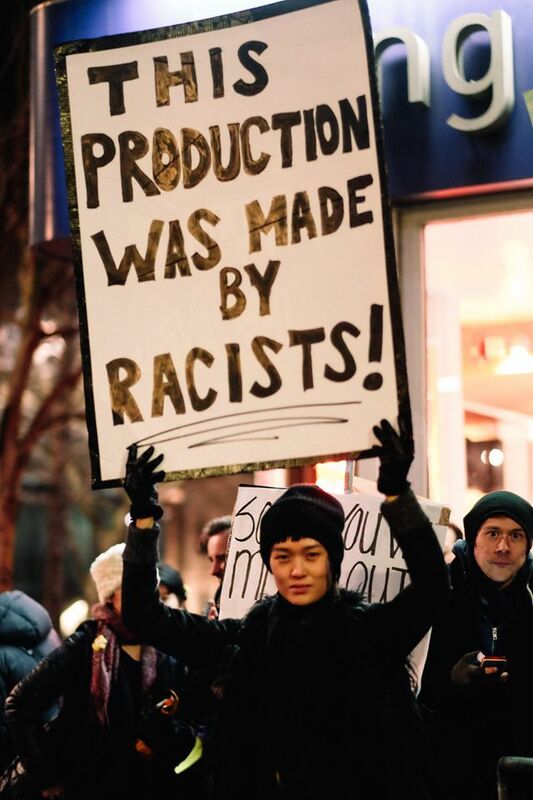 It is just a theatrical device. Yes, this is a common technique, but it is essentially racist. It is the use of other races and cultures to signify the ‘other’, to conjure up an exoticism of the unknown. 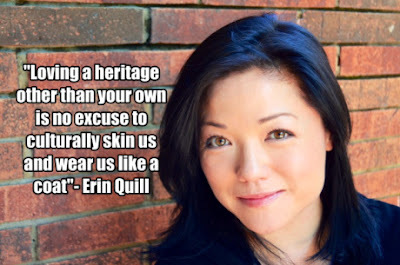 It is cultural appropriation and stereotyping. Our advice? When you are in a hole, stop digging. This is the 21st century. 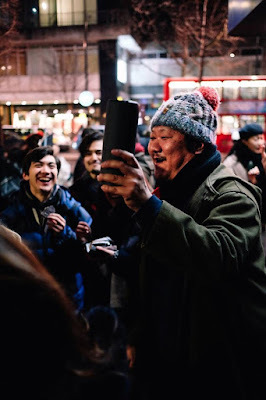 … Admittedly, there are some interesting concepts and a few moments that engage the audience, but there is no doubt that the most memorable and relevant aspect of the play is the controversy it caused rather than its content or delivery. “The ‘Chinese’ nature of the play is within the setting, which is entirely artificial, and the naming of the characters. It’s entirely European in its sensibilities. I’ve only very rarely ever set a play in my own culture – there’s always a distancing effect,” he said. And added: “You have to understand metaphors. The theatre isn’t a place for literalness. We have to accept that anyone from any place or culture can play any role,” he said in an interview in which he went on to claim he had “contempt” for plays that have messages. “Look, the reason I’m a writer is that I don’t involved myself in political and ideological issues. 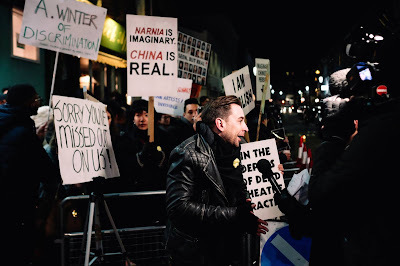 I’m the opposite of writers who enter the theatre to persuade people of their attitudes. It’s not what I do,” he said. In the interview, Barker also criticised Arts Council England, labelling it “preposterous” and something that belongs “in the Soviet era”. “It’s not really interested in art, it’s interested in sociological benefits,” he added…. James Waygood‘s protest report at Grumpy Gay Critic 23.01.17: I joined 200 people on Thursday 19 January for #StopYellowFace: a protest against the racist casting of In the Depths of Dead Love at the Print Room. 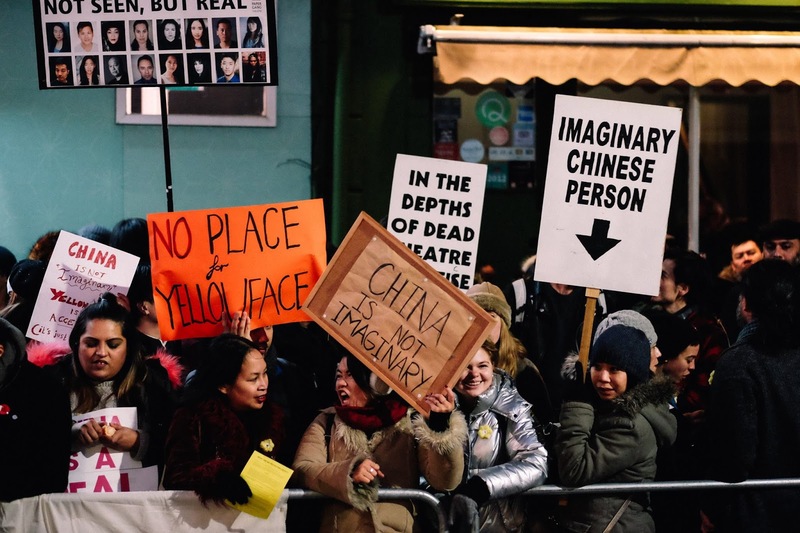 … So, in other words, Chinese people are not “English” whilst white people evidently are and white actors get to be “universal” as well. 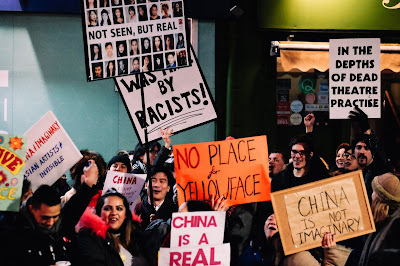 The Print Room compounded this even further, as social media protest built, with another calamitously tone-deaf statement in which they actually told people they shouldn’t get offended and further elaborated on their concept that China is somehow not a real place. … The final straw was an email they sent to their “supporters”, leaked to us, when they complained of a “social media attack” by a “small number” of “members of the public….without consulting us”. 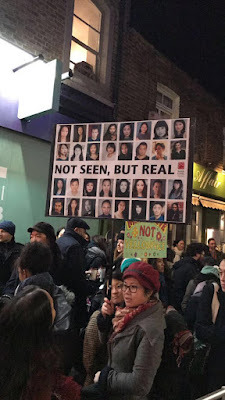 The amount of blatant untruths in such a brief flow of words here is extraordinary but I’ll stick to the fact that myself, theatre director Andrew Keates and the actors’ union Equity had all attempted to contact them but to no avail. … Disagree all you like but at least do it from a place of engagement and knowledge not just because your posh white friends have told you to. 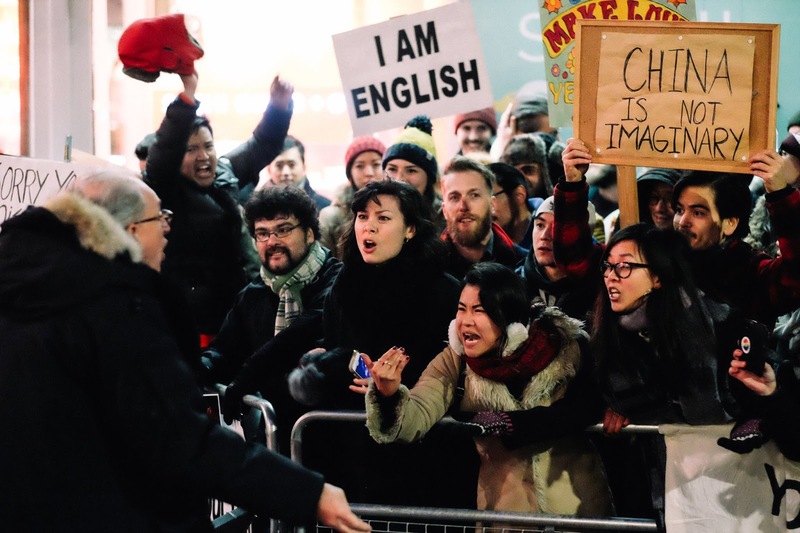 The days of the subaltern model minority Asian surely have to be over. This is our country, our taxes, our spaces. We have just as much right to be there as any white person. Our love is not dead or in the depths. 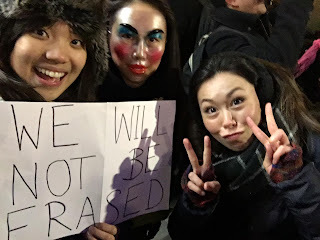 Our love is real #StopYellowface. Papergang Theatre’s PHOTO ALBUM of the Print Room Protest. Photographer Alexander Newton.